Wow Fun Escape 003 is another point & click escape game developed by WowEscape. 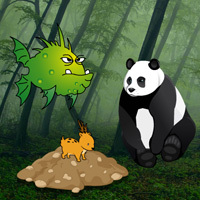 In this game, a panda couple is missing their child. Therefore, you have to help them to locate their offspring by finding useful objects, hints and by solving puzzles. Click on the objects to interact with. Good luck and have fun! Anyone playing. I am stuck in 2nd set of scenes. need 1 more leaf, an 8 digit # hint and a leg of ham? Can't find anything else. I can't find the last leaf neither.. I'm obviously misunderstanding the coloured fish slider. Thought the 48326 coloured numbers were the clue? ?